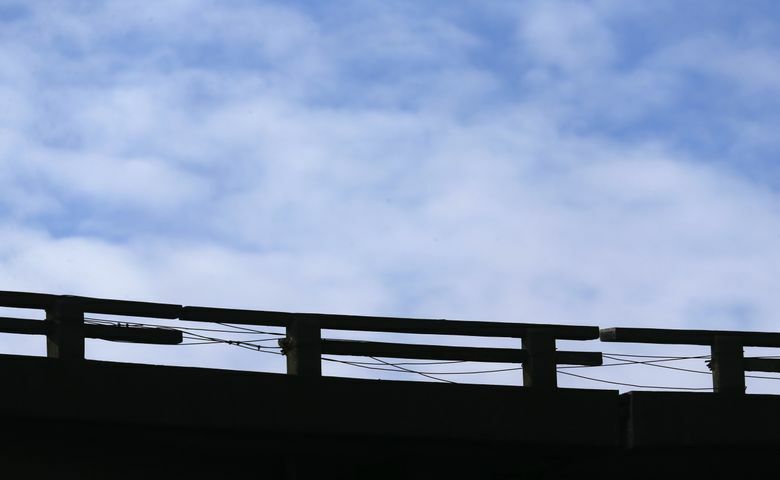 Our elevated highway is coming down, which means we’ll lose beautiful views and a concrete eyesore. The famously loud sound system rocked the packed storefront, now a condo lobby, at the end of South Main Street and along the Alaskan Way Viaduct. The elevated, double-decker highway rose directly above the former disco’s entrance. Aside from the thumping sound system inside Shelly’s Leg, the only other sound on that rainy night would have been the splashing of wet tires on cars and trucks traveling north along the waterfront on the Viaduct’s upper deck and south toward the Industrial District on the lower deck. The Viaduct today is still a nearly all-consuming onslaught of sight and sound, and to stand near it is to literally experience the ground rumbling beneath your feet, your own thoughts drowned out by waves of air. 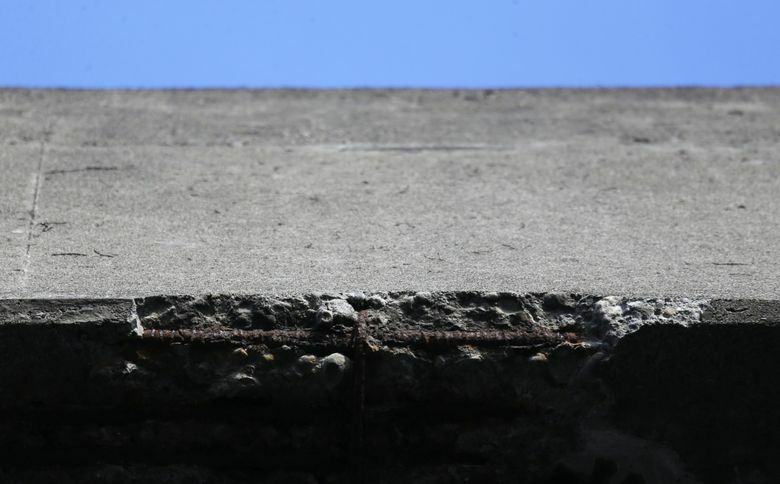 If you live or work in one of loft-style buildings that stand disconcertingly close to the roadway, much of it built on earthquake-vulnernable infill, you regularly are plucked out of daydreams by the uncanny sensation that everything — your building, the liquids in your tea cup, you — is gently shaking. Or is it the sudden realization, borne deep in the corner of the mind where terror hides, that the 110,000 cars rushing back and forth between the Viaduct’s low guard rails every day, and right past your windows, are but a skid away from your worst nightmare? Seattle’s historic Pioneer Square neighborhood, where I live, is full of characters, but there is no more interesting neighbor than this most animating of inanimate objects. Resting on foundations dug 260 feet below ground, where harder soil lies, and rising four stories above street level like a wall around a fortress, the Viaduct has been a relentless presence in this restless city since it opened nearly 70 years ago. 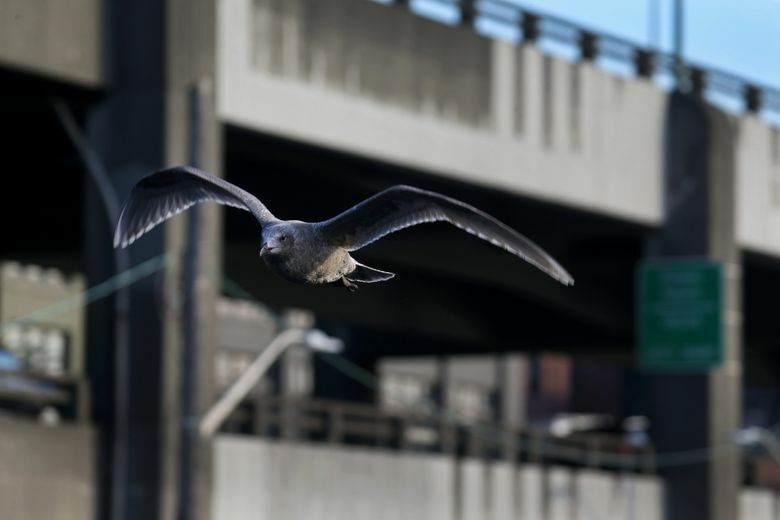 Our restlessness is finally catching up to it: In 2018, as a controversial $1.4 billion deep-bore tunnel along the waterfront nears completion, the roadway’s downtown section will be demolished (a southern section already has been torn down). “We built something that’s so massive and so solid and seems so permanent, and yet we have people here who will see it rise and fall in their lifetime,” says Leonard Garfield, executive director of the Museum of History & Industry. 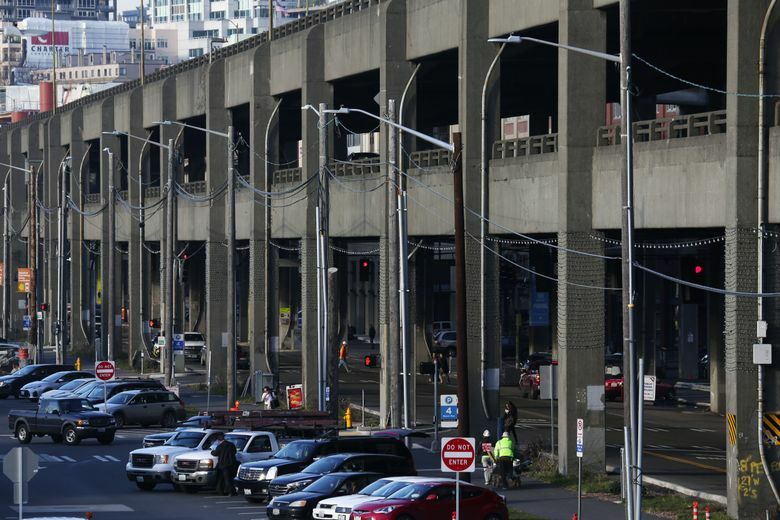 FOR A ROADWAY that has caused so much rancor, concern and scorn over the years, the Viaduct has wistful fans even among detractors. People love to hate it and hate that they love it. It is as if some of us, realizing the end of our captivity is near, have fallen for our unsafe, often-traffic-clogged tormentor. 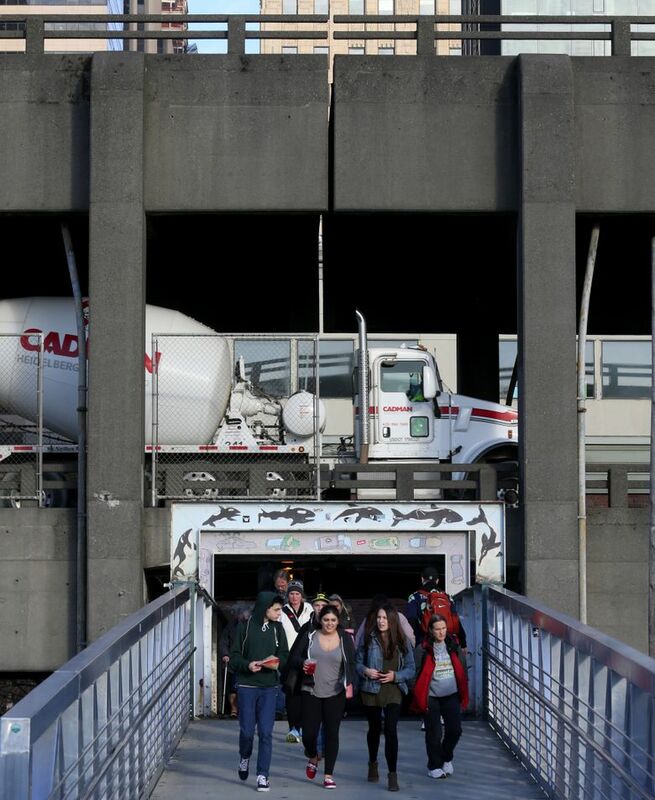 When the 6.8-magnitude Nisqually earthquake struck Seattle in 2001, the ground-settling and cracks it left in the Viaduct renewed calls to replace or remove it altogether. From that contentious debate, the tunnel project was born. 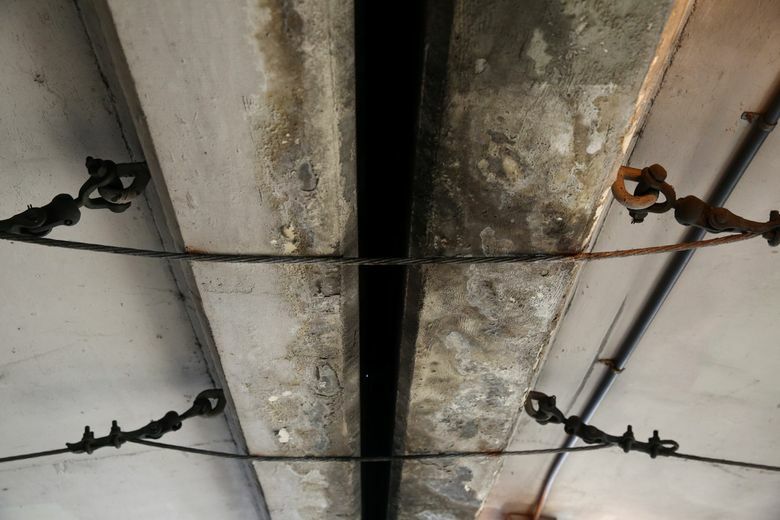 But the quake also left visible scars in the walls of adjacent buildings in Pioneer Square, reminding those who live and work there of the fragile nature of their own dwellings. “You can feel the trucks,” attorney Robie Russell tells me during a visit to his law office at South Main Street and Alaskan Way South, across from the former disco. Russell shows me thin cracks caused by the Nisqually quake in the redbrick interior walls of his storefront space. He moved here after the quake damaged his previous office building nearby. Outside, the Viaduct looms, a canopy of concrete, noise and darkness. Russell says he’s gotten used to the racket, and he seems unfazed by the damaged walls. 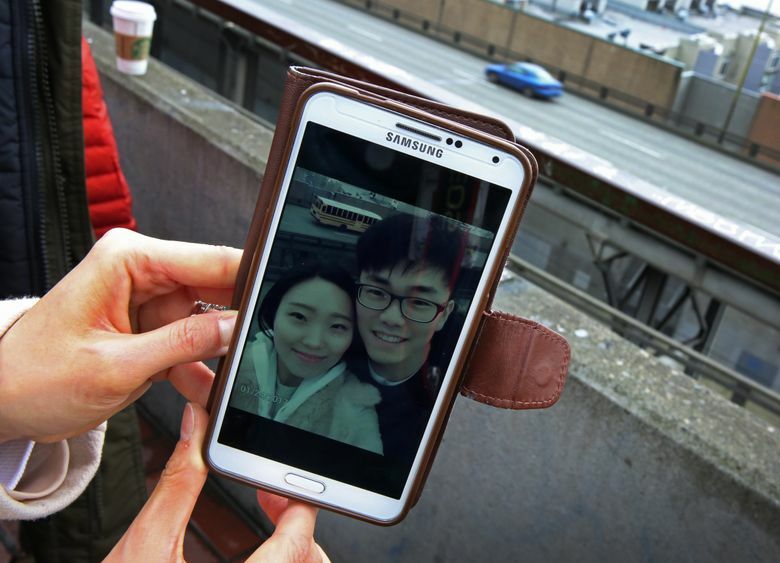 In fact, he waxes romantic about the Viaduct. 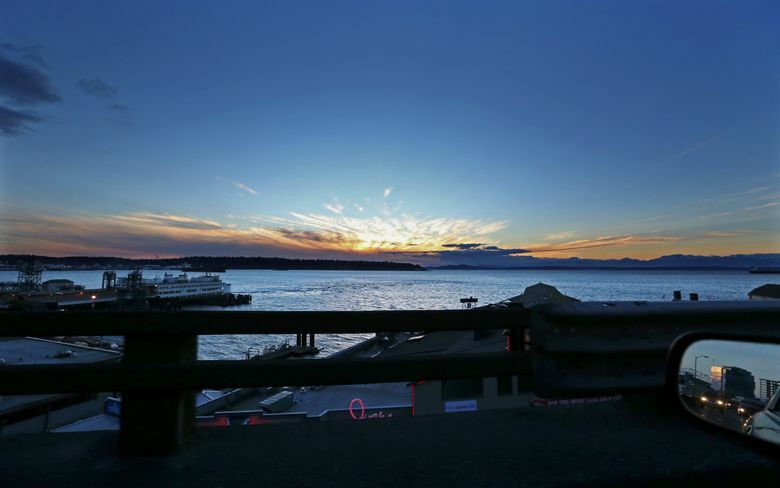 That view, of Elliott Bay and the jagged Olympic Mountains to the west and the steel-and-glass of the city’s ever-changing skyline, really is the stuff of postcards. Driving north along the Viaduct on the upper deck, city and sea merge in a way that the structure itself seems designed to make impossible, and you’re reminded, for the time it takes to skirt the edge of downtown, at least, that we really do live in a city by the bay. From here, the Viaduct is not the imposing, mile-long wall it appears from ground level but rather a precious and fleeting vantage point. Russell’s not the only one I met who has an offbeat affection for the Viaduct. 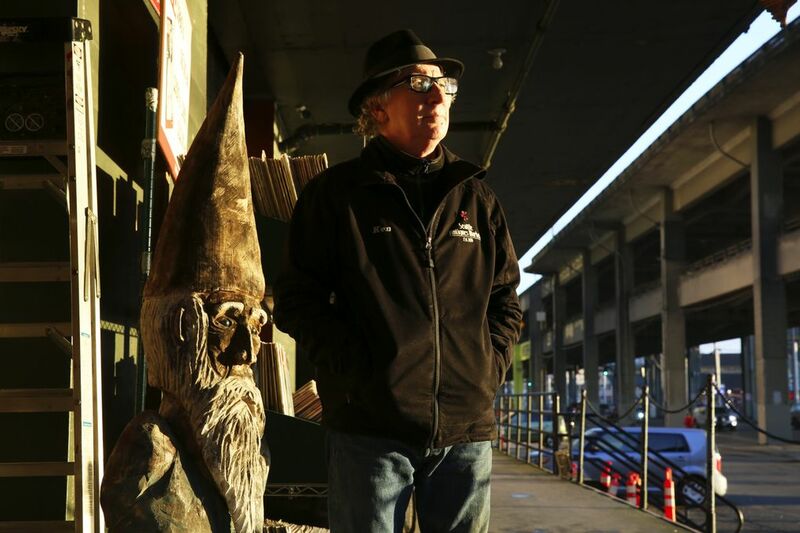 “The noise is there, but I don’t hear it; I’ve been able to turn it off — until somebody mentions it,” says Ken Eubank, owner of Seattle Antiques Market, which has operated alongside the Viaduct in the waterfront business district for 38 years. “But if you really think about it, it sounds almost like the ocean because it’s constant — the sounds go up and down in level. Metro bus operator Candace Versey, who once drove a route that used the Viaduct, says she’ll miss working on the roadway. 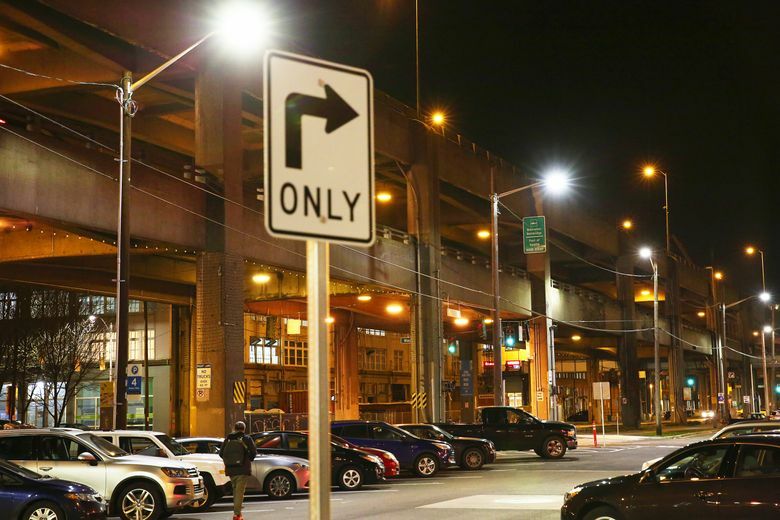 “ANYONE WHO DRIVES on it loves it, and anyone who has to look at it hates it,” explains Garfield, of MOHAI. 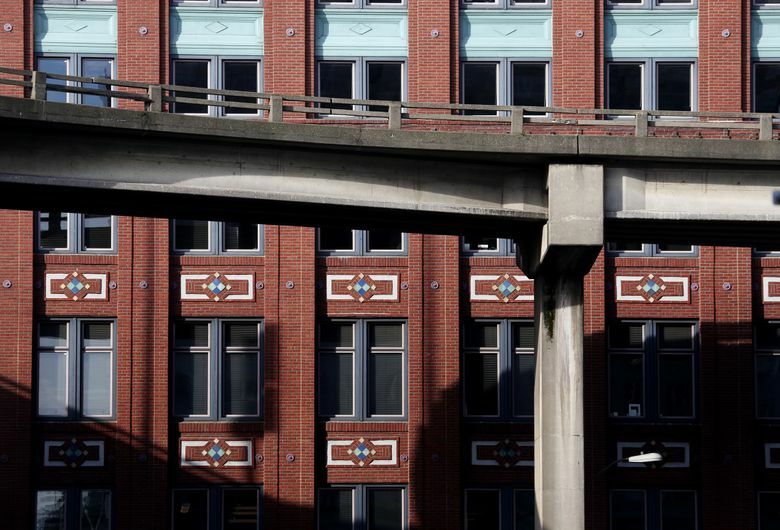 Since the Viaduct’s opening in 1953, he says, arguments about the convenience and mobility it afforded were met with critiques focused on the visual disruption it caused. “It was actually an elegant solution,” a downtown bypass that reduced traffic along the formerly choked surface streets below, Garfield says. 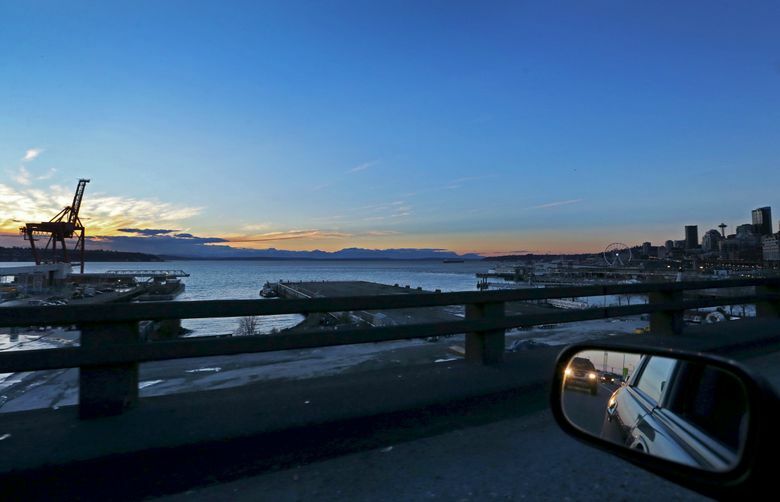 For the first time, you could drive from South Seattle to the North End without the bother of streetlights and stop signs. 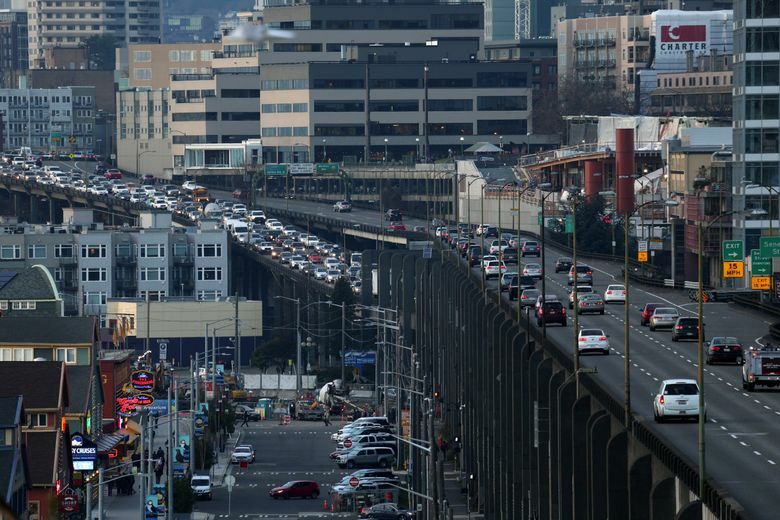 The Seattle Freeway (known today as Interstate 5) came more than a decade later. The Viaduct did what it was supposed to do. It was an awfully perfect solution, albeit perfectly awful in appearance. Even its designers had to acknowledge it was an eyesore, but it was an eyesore we couldn’t do without. That the Viaduct’s completion coincided with — and contributed to — the rapid suburbanization of the region is also noteworthy, Garfield says. The mid-to-late century saw tremendous flux in American cities as the white middle class moved out of dense downtown districts into more spacious, outlying planned communities linked by a new system of highways. The former economic diversity of cities eroded in the process, leaving officials all around the country scratching their heads over what to do. 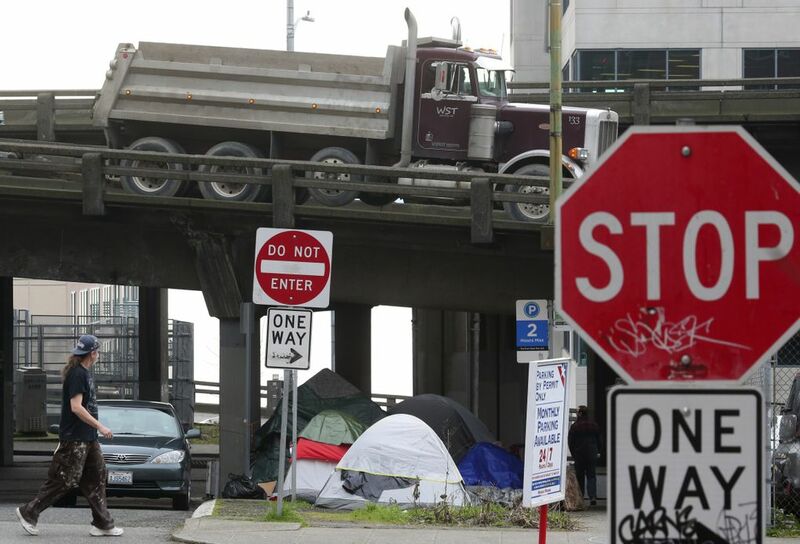 Seattle’s downtown suffered, too. Partly because of this social and economic ripple effect, among many other factors, “The city began to debate tearing down the Viaduct a decade after it was finished,” Garfield says. The life of the Viaduct always has been tarnished by talk of its death, and what would work better. There were all sorts of crazy schemes offered up by city officials as well as community leaders and developers. Turn the whole thing into a parking structure. Turn it into an elevated, public green space. 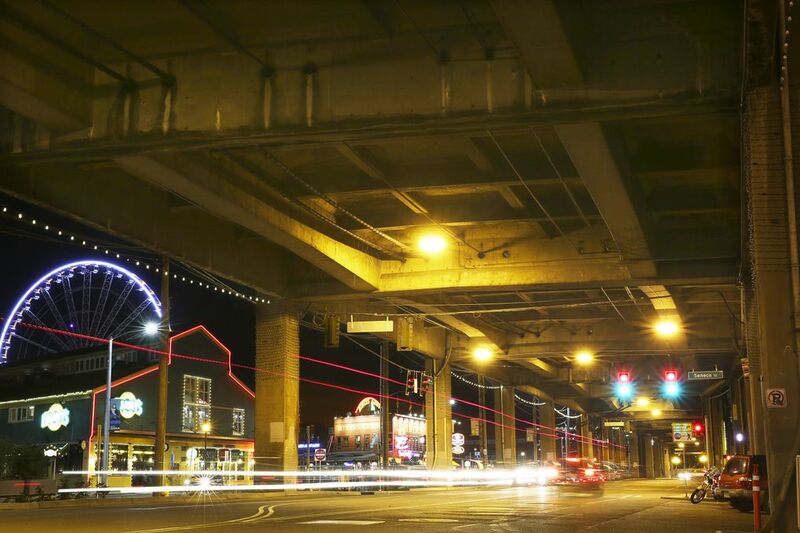 We never really knew what to do with the Viaduct because we’ve never been clear on what kind of city we want to be. We are forever staring into the mirror and fretting that we’ve let ourselves go. The scruffy seaport at the edge of a great wilderness has transformed into a bursting-at-the-seams tech hub where bike lanes feature as prominently as shipping lanes. 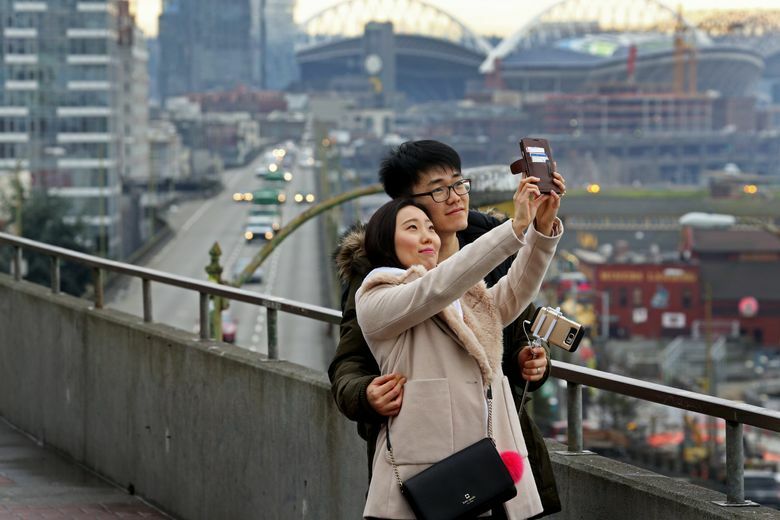 Urban centers are cool again and, given its recent rapid population growth, perhaps none is more attractive and “livable” than Seattle for the kind of well-paid urbanites the city seems intent to lure. 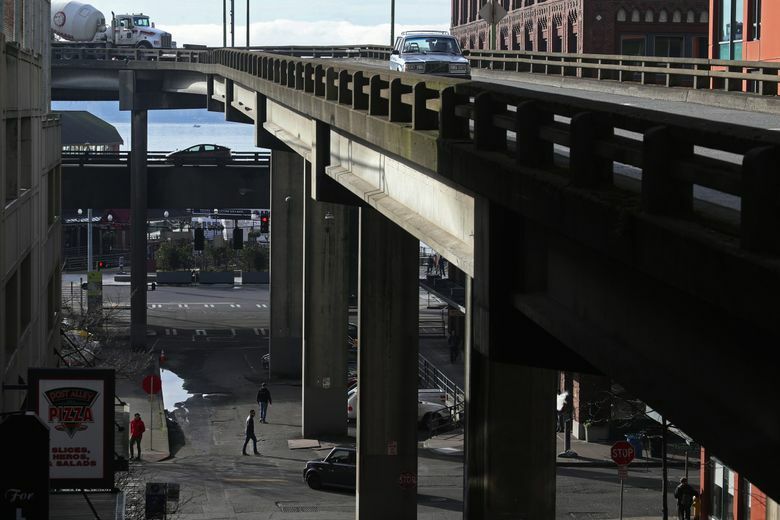 An ugly, domineering Viaduct blocking the waterfront doesn’t fit into that glossy picture. THE THING IS, the making of Seattle reads like a joke in which the punchline keeps repeating itself. We are forever pushing earth, pontooning waters and building roads on stilts in feats of daring engineering, only to find ourselves with bigger problems that require even bolder daring. We have responded to the sheer impracticality of our location at the mouth of an estuary by a deep blue sea on a sliver of steep hills and lakes with infrastructure schemes of almost comic brazenness. 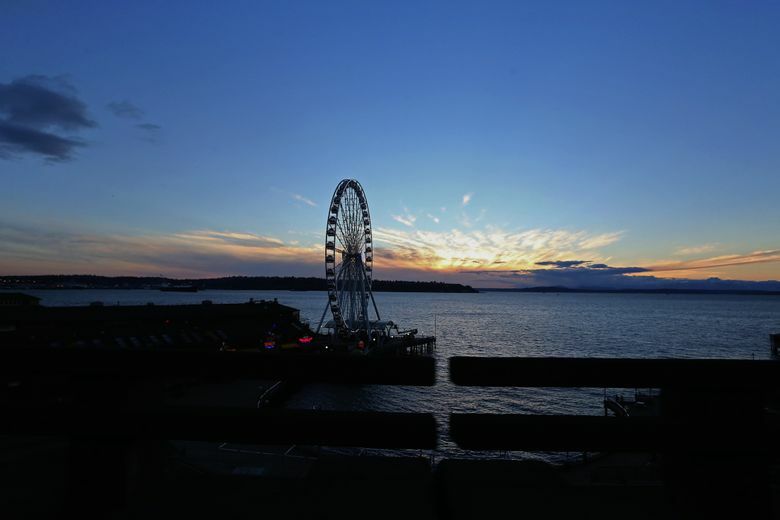 To see archival photos of the original Seattle waterfront when its soggy mud flats were crisscrossed with wooden-trestle roads, railways and sidewalks is to bear witness to a city that exists not so much because of its dazzling location as despite it. The city’s leaders never saw an impediment to progress too great for the might of blueprints and bulldozers. So here we are, staring out at the bay and the mountains through the venetian blinds of a double-decker Viaduct that reveals so much about the city’s image of itself, even as long strips of concrete and asphalt obscure our physical view. 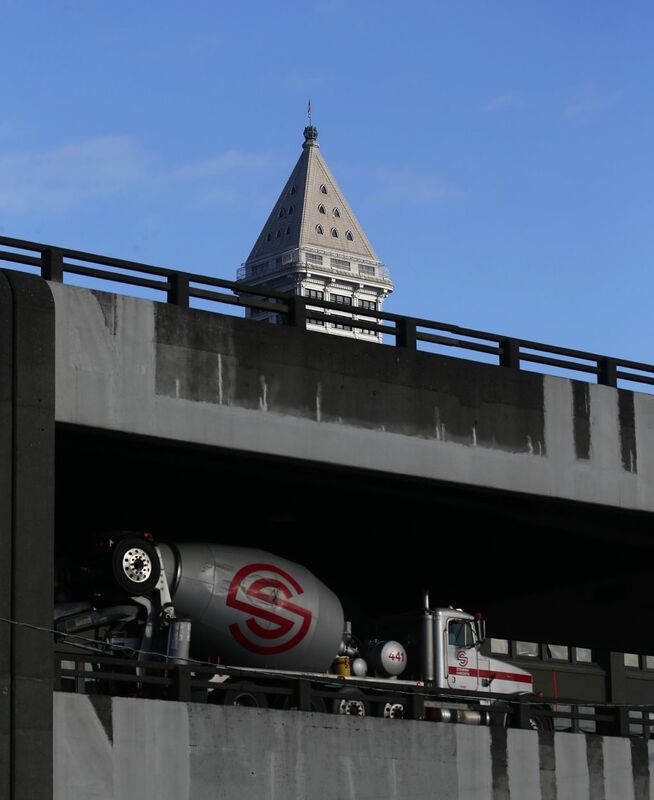 Below, a tunnel-boring machine makes its way through the soft soil of yet more good intentions: Unlike the Viaduct, the tunnel will have no downtown exits and might not make your commute much faster. 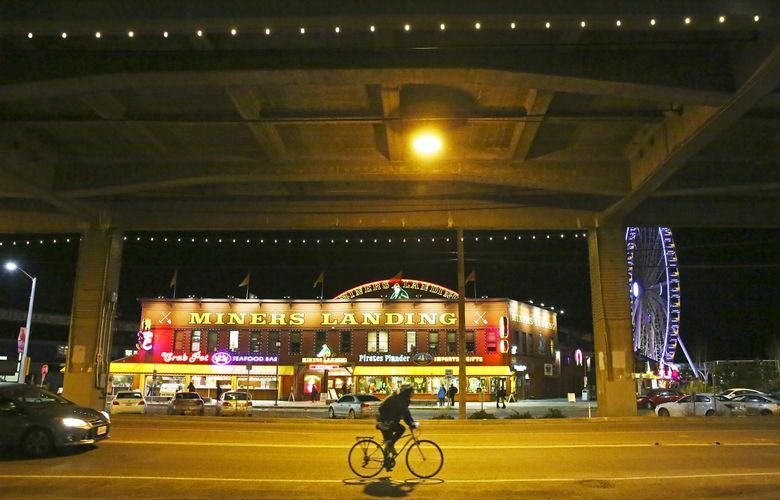 And it will change the character of this slender strip at Seattle’s edge. On a recent First Thursday Art Walk, artist Jose Luis Rodriguez Guerra hosts visitors at his cavernous loft just steps from the Viaduct in Pioneer Square. Out of a side window looking south, cars rush past on the road’s upper and lower decks, just a bit too close for comfort. Guerra doesn’t seem to notice. In fact, he has placed a huge triptych over the west-facing windows, blocking that view of the Viaduct altogether. As the night goes on, the studio fills with friends and strangers, and the wine keeps coming. The place takes on the vibe of a secret lounge. Outside, the looming Viaduct only adds to a gritty, underground atmosphere whose days are numbered. “Once that thing comes down, a lot of these buildings along Alaskan Way, they’re going to see daylight for the first time,” Brian Honda tells me at the minuscule Triangle Pub at the intersection of First Avenue South and Railway Avenue South, in the shadow of the Viaduct. 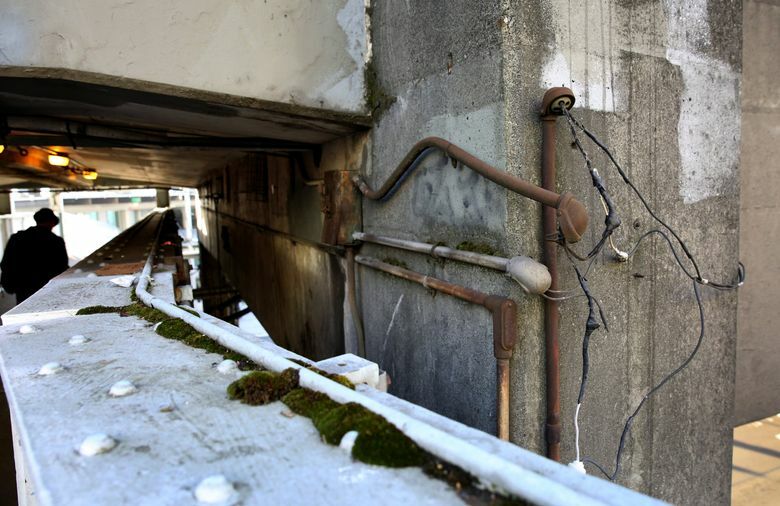 There are plans for a potentially intimidating, eight-lane boulevard along the path of the Viaduct, he notes. Honda’s skeptical that it will connect us with our natural environs more successfully than the monstrous Viaduct, though. “It’s basically gonna be like a superhighway out here; it’s gonna be like crossing the street in Vegas,” he says. 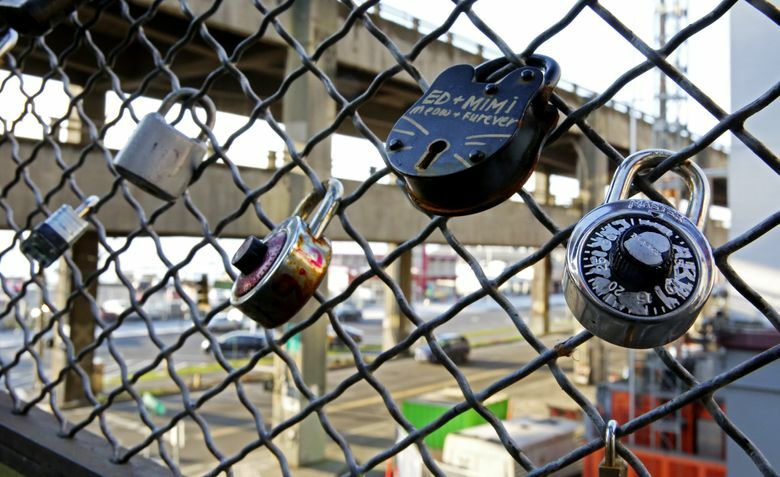 The Viaduct’s presence has been just as problematic over the years. The dancing at Shelly’s Leg came to an abrupt end at around 1 a.m. that night in 1975. 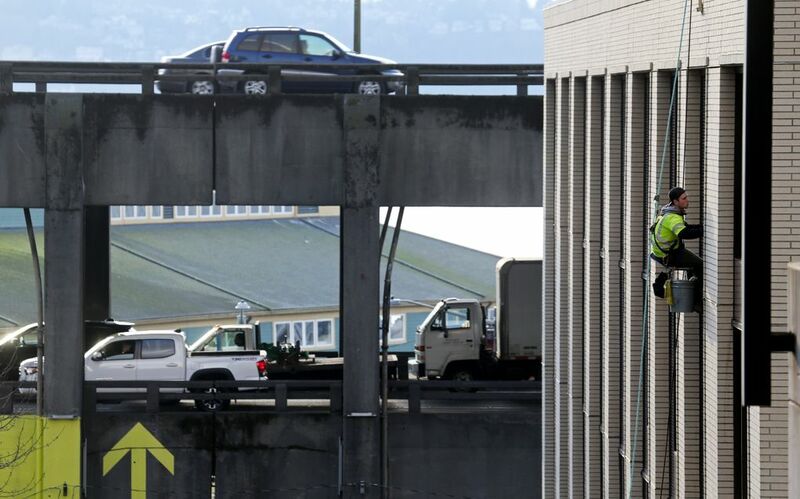 A fuel truck carrying an attached tank trailer struck a guardrail and jackknifed on the slick asphalt of the lower deck near South Washington and South Main streets. The trailer detached from the truck, hit a roadway column, overturned and split open, spilling a river of flaming fuel onto the cars of a Burlington Northern Railway train, some parked vehicles and the building housing Shelly’s Leg. The wall of fire was so hot, it shattered the disco’s windows. Everyone made it out safely through a rear door. Honda tells me of other horrible traffic incidents he’s heard about over the years, part of an accumulation of urban lore told by a roaring highway. The Viaduct lasted longer than the ambitions of the era in which it was built. 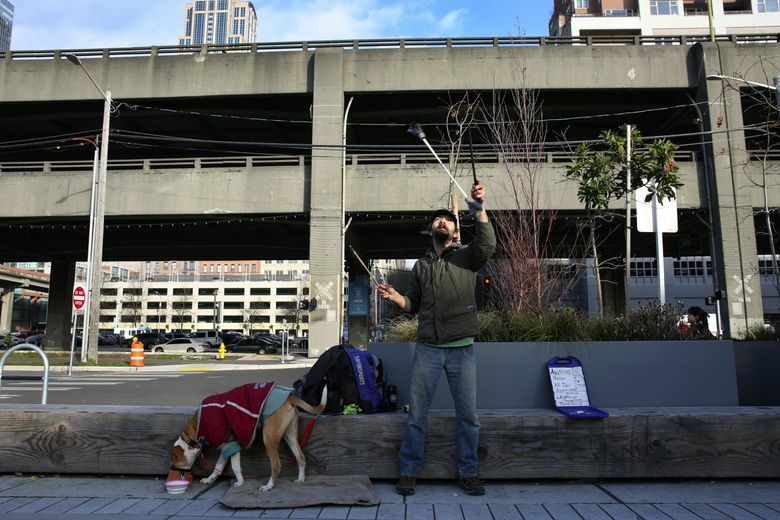 A new vision of Seattle, not just new roads, is set to rise from its rubble. 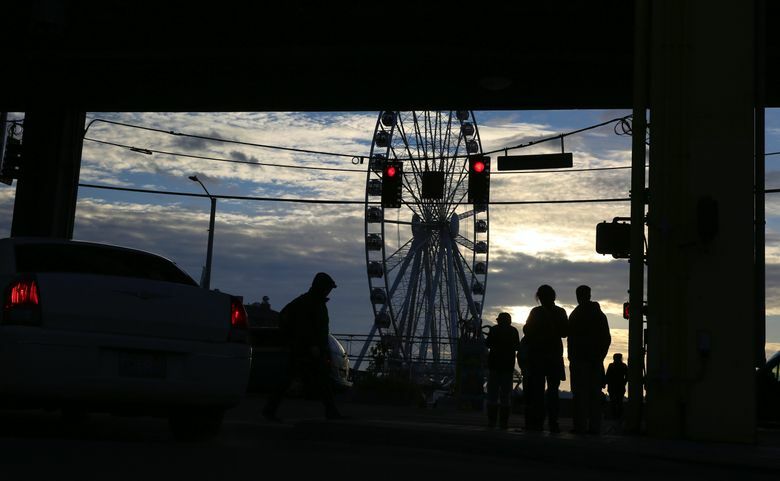 This story was corrected on March 2, 2017, to reflect that the $3.1 billion Alaskan Way Viaduct Replacement Program includes $1.4 billion for the construction of a tunnel.